Selling your home and selling your home quickly for top dollar are two entirely different things. Yep! Anyone can have a comparable market analysis done on their home and put a for sale sign in their yard. But sellers who take the time to properly prepare and market their house are almost always the ones who will sell their home more quickly and the ones who, based on the proper preparation and presentation of their home, will be the ones who routinely get top dollar offers! Because their home appears bigger, better, and more well-maintained regardless of whether that’s true or not. What makes some homes sell faster and for more money than others (aside from the price)? How does your home look from down the street, when you approach the front door? What feeling and emotion does your home project the moment you open the front door? People will make an immediate decision based on a feeling and how your home emotionally makes them feel. People want to feel comfortable, happy, and to experience an indescribable warmth about a home when they walk in. And if they don’t get that feeling, that immediate first impression will leave them feeling empty and they will move on to another house that does make them feel all that. So exactly how do you go about making YOUR house feel like a home to someone else? STAGING—but not just throw something together staging. Well thought out staging that provides potential buyers with a visual and emotional experience from start to finish. This is what will have your buyers feeling that purchasing your home is definitely the right decision…a decision they can make without having any lingering doubts. Before you do anything else, sit down with your stager or with yourself and map out exactly what needs to be done to create the right environment. An environment that will make your home feel warm, inviting, and worth every bit of the asking price, if not more. Well, you simply use the following staging steps for making your house irresistible to potential buyers. You can start by getting into your vehicle and driving around the block, then looking at your house from down the street. Make notes about what you see from a fresh perspective. What needs to be changed? What could you do to make your house look better—to make it pop? Is there anything you could do to make your house stand out and look like the best house on the block? The curb appeal is the first impression a buyer will get of your home. Sometimes a potential buyer will make a decision about whether or not they are going to like your home based solely on how it looks from the outside. So you need to make sure the first impression is a good one. Here are some ideas to make your curb appeal pop. Upgrade or paint your mailbox and add new numbers. Then plant some colorful flowers around the base, or simply add a fresh layer of mulch. Trim all trees, bushes, plants, and rake underneath them to remove old leaves and dead growth. Hang a seasonal wreath on the front door and put some colorful potted flowers nearby as well. Install new door hardware such as new locks, doorknobs, and kickplates. Repaint or stain the front porch (if needed). Powerwash the exterior of your home and roof (if needed). Decluttering, or neutralizing as we prefer to call it, is the next step. Go through your house (and garage) and remove all non-essential items from the floor, walls, countertops, closets, etc. The purpose of neutralizing is to turn your home into a generic canvas that will make it easier for a buyer to see the potential of your home and picture themselves living there. It’s more difficult for a buyer to do that if the countertops are covered with “stuff,” the closets are overflowing, and they see pictures of your family on the walls. Remember, removing as much as possible from your closets and pantries will make them look bigger and help potential buyers see their full potential. You have to pack anyway, so why not get a jump start and pack up anything you don’t use on a daily basis and put those boxes in a temporary storage or friend’s garage. Doing so will also make your home look and feel bigger which will help your home sell more quickly and more likely to sell for top dollar. Now it’s time to thoroughly clean your house and that means every nook, cranny, ceiling, wall, light fixture, closet, windows (inside and out) baseboards—everything! Hire a professional if you have to, but this one step could mean the difference between a good offer or a bunch of lowball offers. Remember, perception is everything. If potential buyers see a nice clean house, their first impression will be that your home has been well cared for. And, it will give them that comfortable feeling we talked about earlier when they first walk in. Sometimes staging requires the removal of large or excess furniture. And sometimes it just means rearranging your furniture so it highlights the best use of the space. Whatever the reason, your goal is to create a blank canvas for potential buyers. So if that means removing that oversized sectional and renting a simple couch that better showcases that space, then that’s what you need to do. You should look around and do whatever’s necessary to highlight your home’s space and make each space look bigger. Organizing, cleaning, and decluttering the garage (and your shed) is just as important as doing it for the inside of your house. A clean, well-organized garage will give the impression that the house has been well cared for. Not to mention it will help potential buyers envision what they picture using the garage for themselves. Remove anything you won’t immediately need and trash (or donate) anything you haven’t used within the last year or so. And, if you are so inclined, go ahead and paint the garage floor (using the proper paint) and walls as this is just one more visually appealing thing that will make your home appear better than most. We all know our homes have “lived in” odors we can’t smell ourselves—also known as nose blind odors. Have your friends and family come over and give you an honest assessment of any odors they detect so you can address them appropriately. Do they smell cooking odors, pet odors, cigarette odors, mold, mildew, or anything else? Now that you know what odors are lingering in your home, it’s time to deal with them. How tough those odors are will determine what lengths you need to go to get rid of them. Candles and air fresheners are nice, but they aren’t always the best way to address certain odors because the underlying odors are still there. That means your potential buyers will smell an air freshener and odor combination which ultimately makes the problem worse. Here are some suggestions for the worst odor offenders. Cooking and Cigarette Odors. For these odors, you might need to use an ozone machine to get rid of them. This generally requires hiring a professional and you will have to be out of your home for the day. Pet Odors. For pet odors, usually, cleaning the floors and carpet (even if you had a pet treatment done) is not enough. And sometimes, even if you have new carpet and padding installed, if you didn’t treat and seal the concrete prior to installing the new carpet and pad, the smells will generally come up through it. Therefore, if you have tough pet odors that have saturated the concrete underneath, you will have to treat and seal the concrete before installing anything over it. Replace All Window Treatments. For most tough odors, if you don’t replace the window treatments, fabric or otherwise (because they generally retain odors), cleaning everything else won’t completely solve the problem. And don’t forget to have your furniture cleaned as well, especially if it’s fabric. Vent Cleaning. Having your vents cleaned will help get rid of lingering odors and it’s also something positive you can tell potential buyers. That’s one less thing they will have to do and it shows you diligently perform routine maintenance on your home to keep it in tip-top shape. Turn everything off and pay attention to what you hear. Do you hear planes, trains, automobiles, noisy neighbors, barking dogs, a neighbor’s malfunctioning AC fan motor, knocking pipes, etc? Most of the time, with your HVAC, TV, radio, and other white noise in the background, you won’t hear these things. However, when people are touring a house, they generally tour when those things are not on. That means all the noise you generally wouldn’t hear is amplified. Therefore, if you do hear anything while it’s completely quiet in your home, consider having some soft music playing in the background to help reduce that noise as much as possible. Remove all signs that you have a pet, including pet bowls, toys, grooming items, collars, beds, etc. Then go to your backyard and pick up all the pet items there as well. And don’t forget to scoop any pet dirt prior to showing your home. Some people won’t buy a home that has had a pet in it so it’s best to eliminate as many signs that a pet lives there as possible. Make or have made some tent cards that state your home’s most valuable features such as “New HVAC,” New Roof,” “Large Walk-In Closet,” “Granite Countertops,” etc. then place the tent cards on the item it represents. This will draw a potential buyers attention to that item and since it’s a visual, they will be more likely to remember it as well. Using tent cards works beautifully for drawing attention to your home’s features and you can bet no other home they’ve toured has them which will make your home standout! This is similar to the tent cards we mentioned above. Ask your real estate agent to give you the first and/or last name of the person who is going to be touring your home. Then use their name to personalize your tent cards. For example, on the front door you could put a tent card that says “Welcome Home Jones Family” then you could put one in the kitchen that says “Jones Family Kitchen” and any other feature you could personalize with a tent card. This will make your potential buyers feel welcome and more as if it were their own. Add some fresh flowers to your dining room table, desk, kitchen, and/or any other highly visible area. This creates a fresh, clean, inviting feeling that will help make your potential buyers feel more upbeat and at ease. In addition, if you bake some treats right before they arrive and leave them on the counter with a note that says Welcome and Please Help Yourself, this is just one more gesture that shows you care while engaging the senses in a positive way. You don’t have to make anything from scratch if you don’t want to. You could simply buy a roll of cookie dough and pop a few in the oven right before the appointment. Showcasing the area, the neighborhood, and the lifestyle opportunities it poses is a great way to show people exactly what it would be like to live there. This is going to require some good old-fashioned tactics like taking some pictures, gathering brochures and menus, printing reviews of fun things to do in the area and putting them into a Lifestyle Opportunities photo album, or perhaps making a collage on some posterboard. This will help your potential buyers see how much your area has to offer and how it could boost their quality of life. Or, if you don’t want to go old-school, you could drive around and record a video of these same things and have the video playing on your laptop or TV as they tour your home. Seeing is believing and you can bet no other house they’ve looked at has done this! Showcase your backyard by turning it into an outdoor living space if you don’t already have one. This will make your house’s actual living space feel bigger because it extends outside to a place where potential buyers can envision themselves entertaining, relaxing, and/or barbecuing. You could add a firepit, table and chairs, TV and bar area, bocce ball, install a hammock, etc. You will probably want to replace the windows or the window glass panes if the seals are broken and are so fogged you can’t see out. In addition, make sure all your doors open and close easily, and if they make any given room look smaller, then you might want to remove that door for now. Another visually appealing touch is to replace all the hardware on your cabinets, drawers, doorknobs, etc. So when people touch them, they look and feel nice and new. It’s best, whenever possible, to replace anything that needs to be replaced and repair anything that’s broken unless you are selling your house “as is.” Talk with your real estate agent for additional advice about which items, if replaced, will bring you a return on your investment. If at all possible, it’s best to have your home painted inside and out prior to putting it on the market. Painting is the single most effective thing you can do to make your home more marketable. And if you can’t afford to have the entire home painted, at least paint the trim, baseboards, shutters, and doors. 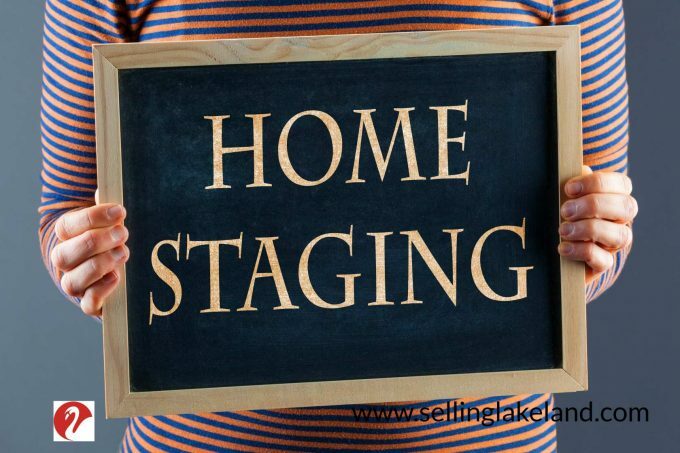 Here are some popular tips and tricks professional stagers use to showcase a home. Set the dining room table and add fresh flowers. Add nice, new throw pillows to the couch. Add lighting to brighten dark rooms and corners. Clear everything off your countertops except a few decorative items. Pack everything in your kitchen cabinets and closets to make the space look bigger. Remove all refrigerator magnets and clean the door seal. Empty all trash cans and store them out of sight. Only use neutral colored paints and remove any taste specific decor. If the dining room is small, use a small table with only two chairs. If the bedroom is small, use a smaller bed, small furniture and less of it to make the room look bigger. Keep window blinds closed to areas where the view is not stellar. Whatever you do, don’t skip the staging and don’t stage anything unless you do it right. Otherwise, your staging efforts, if not done properly, could have the opposite effect. The goal is to showcase your home’s features, not its weaknesses. Home staging, when done right, will almost always bring you higher offers and will also help you sell your home more quickly. 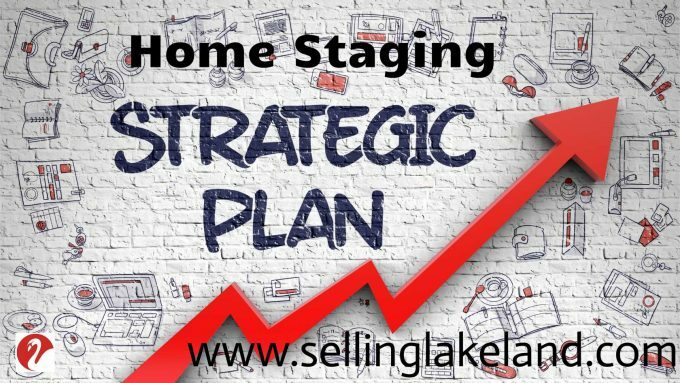 So talk with your real estate agent about implementing some of these home staging tips. Or better yet, have your home professionally staged.